Hennen Furniture: You won’t want to miss our Spring Fling savings & giveaways! You won’t want to miss our Spring Fling savings & giveaways! Spring is finally here! Time to open the windows and pull out the patio furniture! 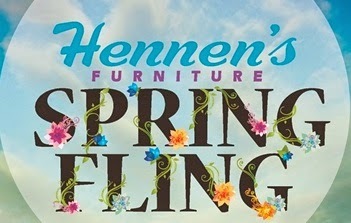 At Hennen Furniture, we are getting ready for warmer weather with our Spring Fling Sale Event. Thinking of giving your home furnishings a makeover this spring? Stop in and see our new spring collection. You’ll find extra special furniture and mattress discounts throughout the store along with a chance to register for door prizes and gift cards. See store for details, some exclusions apply. Saturday, April 25, 10 a.m. – 5:30 p.m.
Sunday, April 26, 12 p.m. – 4 p.m.
Register to win a Howard Miller wall clock, Homecrest stamped tables, or even Dr. Dre headphones. Jackie J's Formal Wear will be sprinkling dress displays throughout the showroom for some added fashion flair! If you're a bride-to-be, enjoy some dress ideas as well as furniture deals for the newlyweds! Great savings abound including 20% off purchases of $499 or more. Visitors to our Willmar store will also have a chance to win $3,000 in prizes. Everyone who visits our Willmar store during our Spring Fling is guaranteed a prize. At our St. Cloud store, we’ll also have expert guest speakers with tips on how you can freshen up your home in time for spring. At 2 p.m, find out what’s trending in interior paint colors and learn new application techniques from Ted at the Paint Store + Moore. Want to decorate your deck or patio with potted plants this season? Come listen to Jacquie from Southway Greenhouse and Floral at 3 p.m. for planting tips and a sun and shade plant demonstration. If new patio furniture is on your wish list, don’t forget to stop by our patio store for all your favorite outdoor furniture brands. At Hennen Furniture, we have a huge selection of all the best patio and outdoor accent furniture, including Seaside Casual, Tropitone, Homecrest, Breezesta, and Woodard. Come see us at Hennen Furniture today!